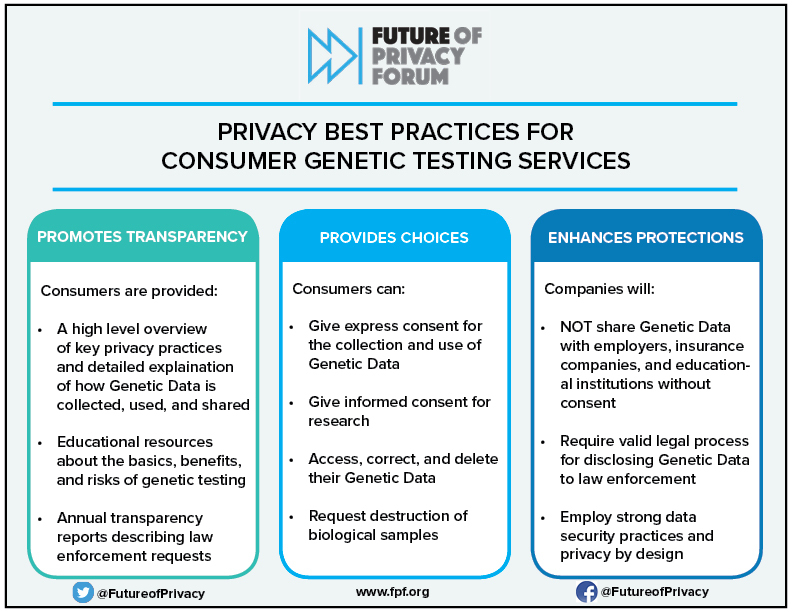 The Future of Privacy Forum, along with leading consumer genetic and personal genomic testing companies 23andMe, Ancestry, Helix, MyHeritage, and Habit, released Privacy Best Practices for Consumer Genetic Testing Services. These companies have been joined by African Ancestry, FamilyTreeDNA,* and Living DNA in supporting the Best Practices as a clear articulation of how leading firms can build trust with consumers. Consumer genetic tests, tests that are marketed to consumers by private companies, have empowered consumers to learn more about their biology and take a proactive role in their health, wellness, ancestry, and lifestyle. When consumers expressly grant permission and provide an informed consent, they can choose to share their genetic data with responsible researchers to help them discover important breakthroughs in biomedical research, healthcare, and personalized medicine. Supporters of the Best Practices include: Ancestry, 23andMe, Helix, MyHeritage, Habit, African Ancestry, FamilyTreeDNA,* and Living DNA. Should you have questions about this report, please contact the lead author, Carson Martinez, at [email protected].